Legend has it that a leprechaun's secret hiding place for his pot of gold is at the end of the rainbow (at least that's what I learned from eating Lucky Charms). Of course, we all know the end of the rainbow is impossible to reach, seeing as it's a never-ending optical effect. The good news is that you can still have your pot o' gold, and just in time! St. Patrick's day is this Saturday and hopefully you've stocked up on as much Guinness as I have. Yes, I may have married an Italian, but I'm Irish and St. Pat's is one of my favorite days of the year. 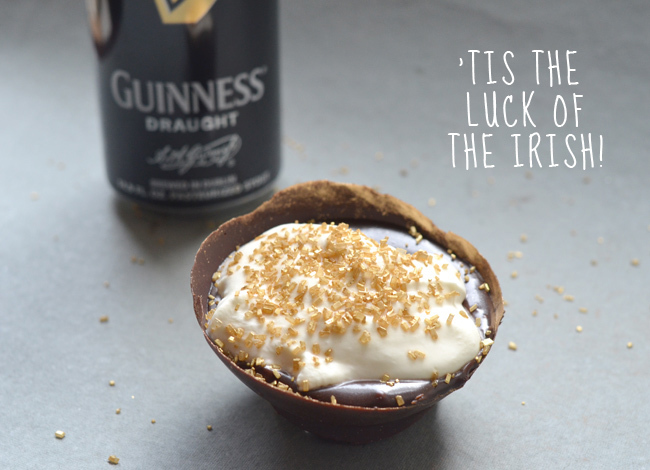 Dark stouts can add depth and flavor when you cook with it, so I set out to create a dessert that would utilize Guinness. 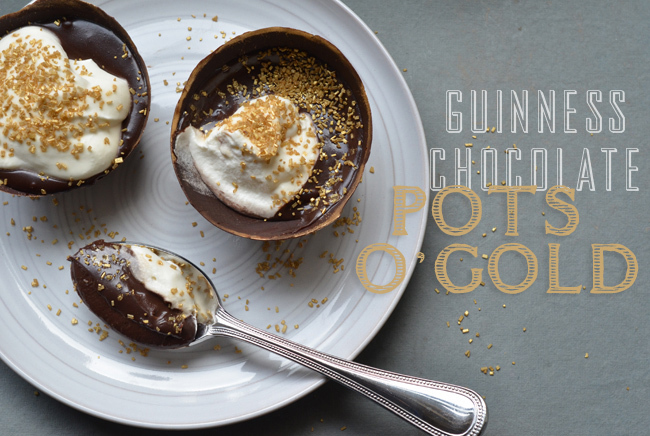 I stumbled across this delicious recipe for Chocolate Guinness pudding from Chef Shane Coffey and I've adapted it for these festive little pots o' gold. I halved the recipe, and substituted the Guinness whipped cream for a Baileys Whipped Cream (See my previous obsession with Baileys here). Overall, these pudding cups were amazing! 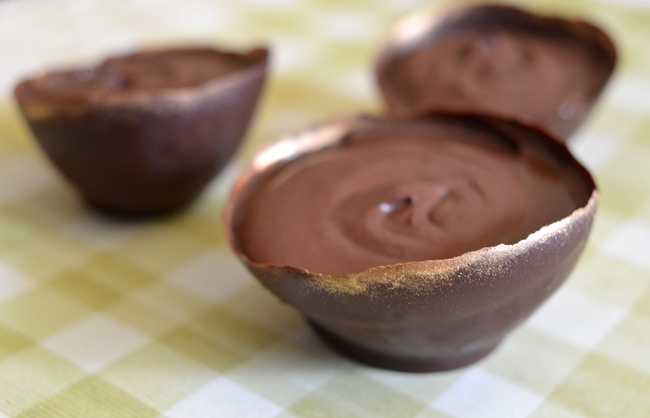 The chocolate cups are incredibly easy to make and look very fancy once they set. 1. 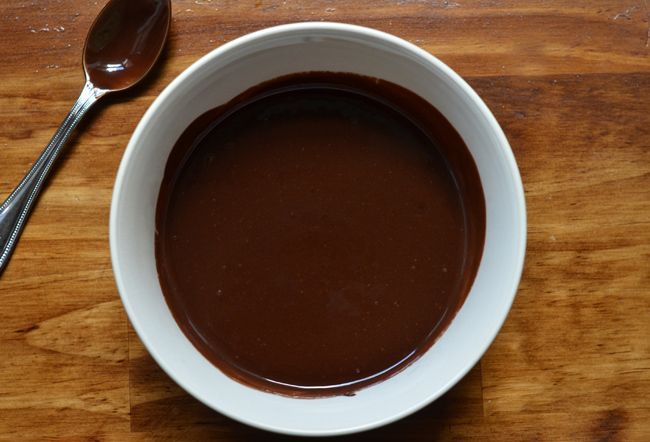 In a microwavable bowl, melt the semi-sweet chocolate in 30 second increments. Stir after each increment, until chocolate is smooth and melted. 2. Inflate balloons to about 4-inch diameter, then knot. 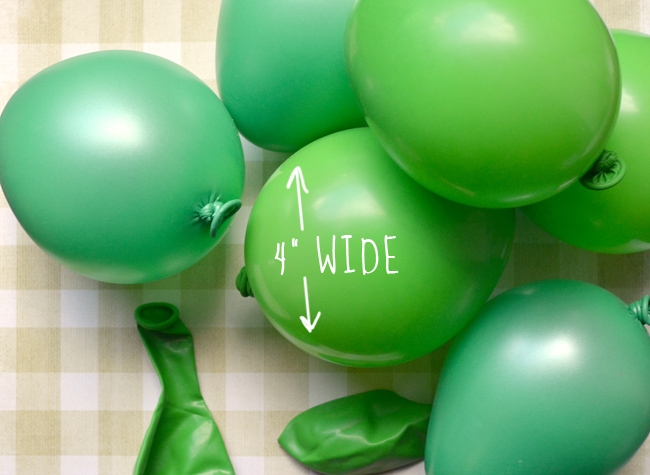 Wipe balloons with a damp paper towel to make sure they're nice and clean. 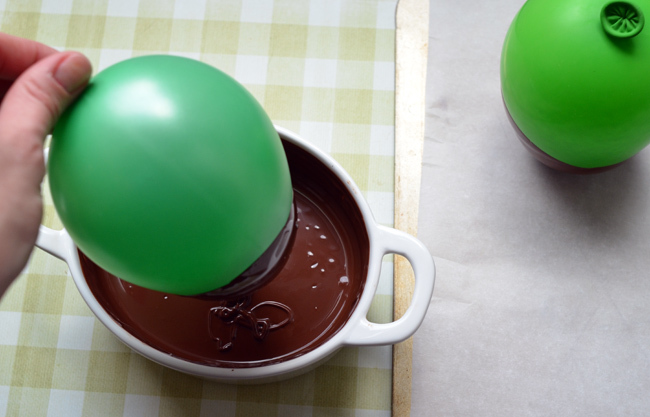 Hold balloons by the knot and dip into chocolate, rotating to ensure plenty of chocolate coverage. Place balloon, knotted side up, on parchment paper-lined baking sheet. 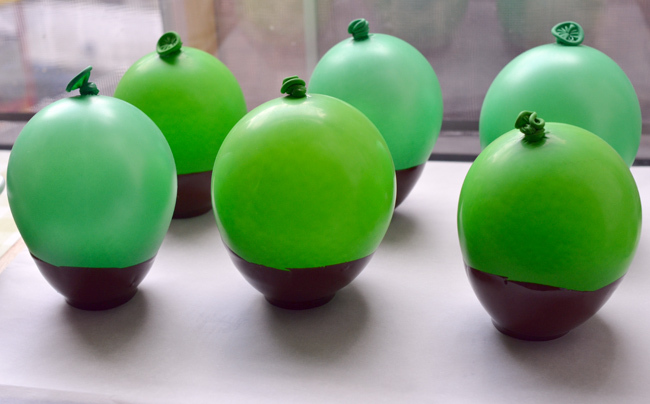 Repeat with remaining balloons to make 6 cups, then refrigerate for at least an hour. 3. Use scissors to snip a hole in each balloon. 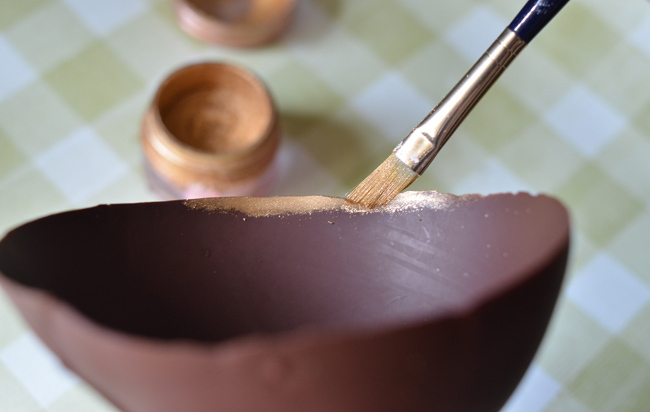 Once balloon is deflated, carefully peel away from chocolate. Continue to refrigerate cups until needed. 1. In large mixing bowl, whisk together egg yolks and sugar. 2. Open can of Guinness and pour into saucepan. 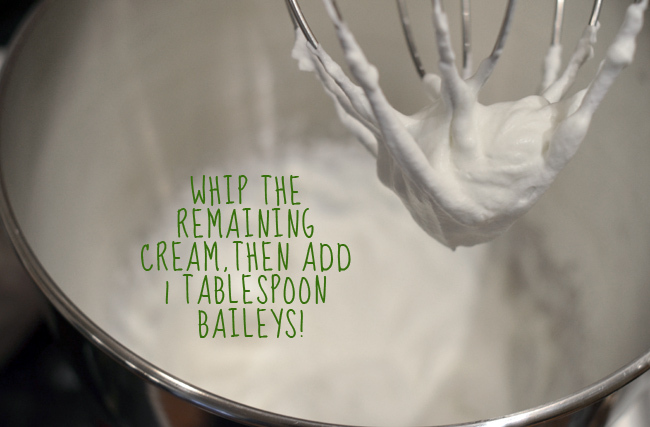 Add 1¼ cups cream and whisk to combine. 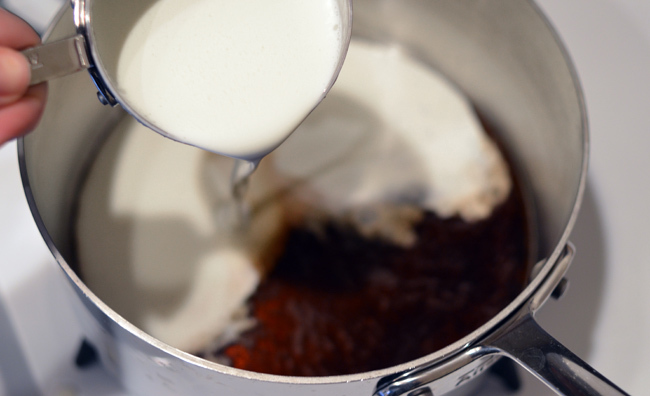 Set over medium heat, whisking occasionally, until bubbles begin to form at the edges. 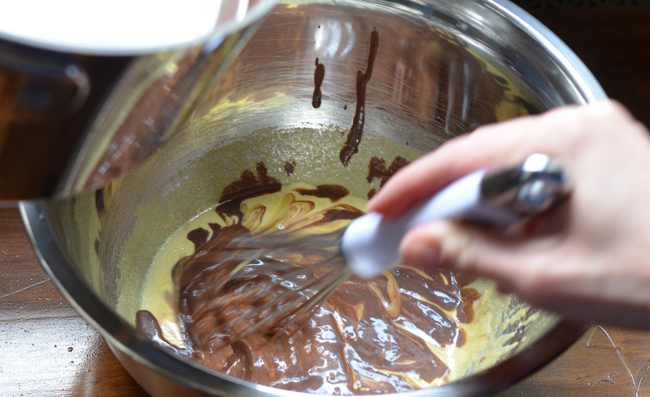 Remove from heat, add chocolate and whisk until smooth and all chocolate is incorporated. 3. 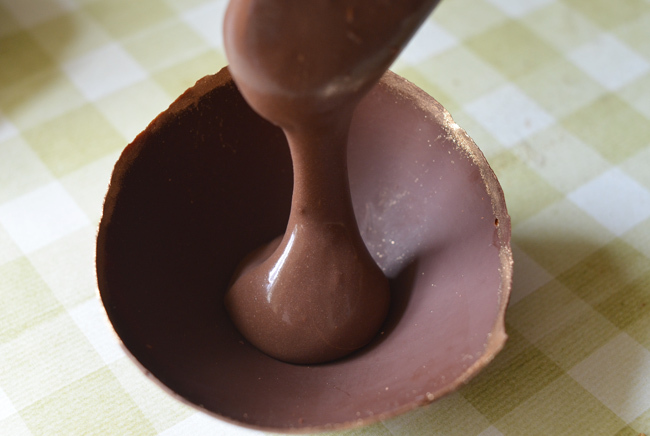 Slowly pour hot chocolate mixture into eggs, whisking constantly. Return mixture to saucepan and set over medium-low heat. 4. Cook, whisking constantly, until mixture thickens. Mixture should be thick enough to coat the spoon. Pour pudding into a bowl and cover with plastic wrap. 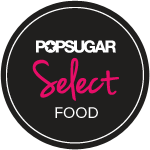 The plastic wrap can touch the pudding surface to prevent skin from forming. Refrigerate overnight, or until chilled and set. 5. Beat remaining cream until soft peaks form. Add 2 tbsp. Baileys Irish Cream and beat until stiff peaks form. 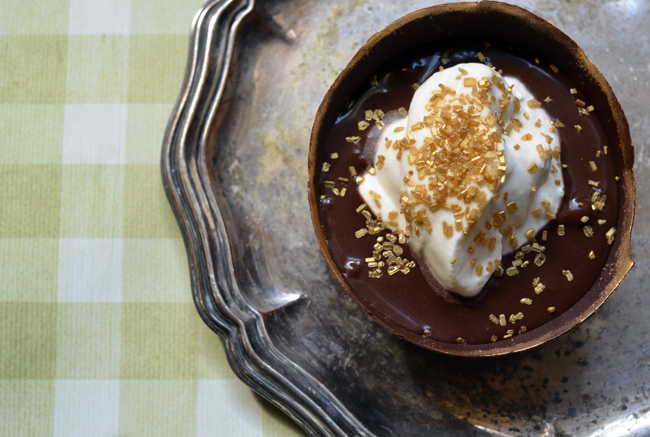 For an added touch o' gold, I painted edible gold pearl dust around the rim of the chocolate pots. You can buy it at any cake decorating or craft store. Had I actually found my pot at the end of the rainbow, I'd probably use this real gold leaf to garnish my pots. These are best assembled just before serving. Spoon pudding into chocolate cups, leaving enough room for the whipped cream. 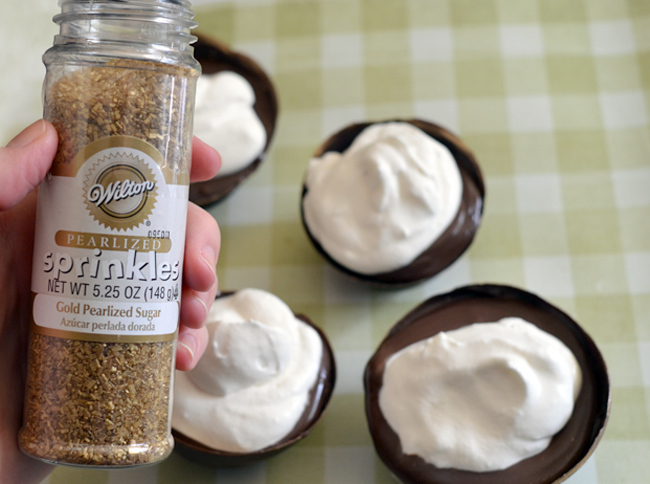 Top each pot with a large spoonful of whipped cream and garnish liberally with gold sprinkles. Happy St. Patrick's Day! I love it! Thanks for creating that video demo as well. I will try that recipe of yours and will make sure that it goes with no less than special luxury tissue paper when I present it in my pastry cooking class.